WASHINGTON – Sen. Jeff Flake, R-Arizona, begins the 2018 election cycle with $580,000 in the bank, a history of disagreeing with President Donald Trump – and a target on his back. With almost two years until midterm elections, experts say Flake can expect serious opposition in his re-election bid from Republican and Democratic challengers alike. Despite the president’s lukewarm performance in approval polls, he is still relatively popular with Arizona Republicans, which could make for a difficult primary for Flake and force him to veer right. And if Flake survives the primary, Trump’s unpopularity with the rest of the electorate could cause problems in the midterm general election, which historically goes against the party of the sitting president. The only Republican challenger to have entered the race so far is Kelli Ward, a former state senator who unsuccessfully ran against Sen. John McCain in 2016. Flake’s office did not respond to repeated requests for comment on the election, except to confirm that he does plan to run for re-election. But when Ward announced her bid in October, Flake said he will be ready for any challenges. Ward has branded herself a Washington outsider and a conservative in the mold of the president. She said she thinks that Flake’s finances, coupled with the same sentiment in Arizona that elected Trump, could carry her past the incumbent senator, and eventually, to the Senate. But Ward faces an even more daunting fundraising challenge than Flake. She ended her 2016 campaign with about $52,000 on hand compared to Flake’s $580,000, according to their year-end reports with the Federal Election Commission. That said, Arizona State University political science professor David Wells said Flake’s finances still leave something to be desired. At this point in his last election cycle, however, two years before Flake would win a Senate race for the first time, his 2010 year-end FEC report showed he had around $628,000 on hand. By the end of that election cycle, he had raised more than $9 million. “The key factor that might throw cold water on a lot of these candidates is Jeff Flake’s campaigning and fundraising prowess,” said Jaime Molera, a partner at public affairs firm Molera Alvarez. 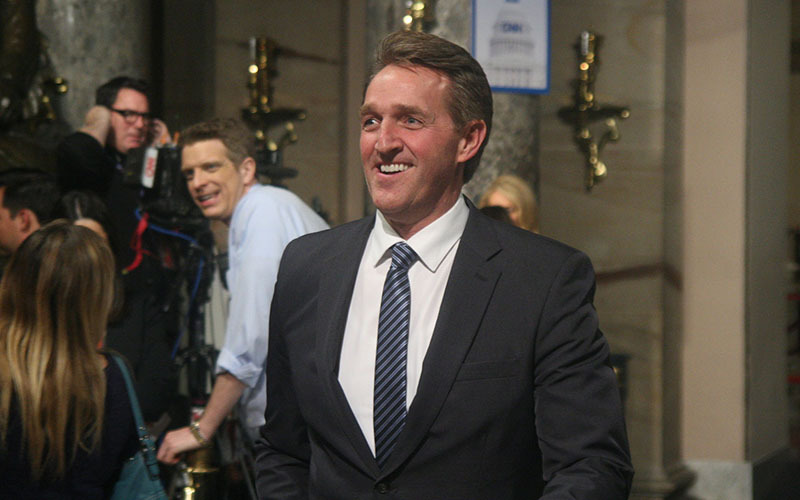 Ward said Flake is still vulnerable because of his support of “amnesty that people don’t want here” and for his support for the Trans Pacific Partnership, the multinational trade deal that Trump pulled the U.S. out of in his first days in office. Ward was referencing Flake’s sponsorship last year of the SAFE Act, which would extend three years of protection to immigrants who are already protected under the Deferred Action for Childhood Arrivals program. But that act would also have required that the Department of Homeland Security detain undocumented immigrants arrested or convicted of major crimes. Although Ward is the only confirmed primary challennger, Arizona Treasurer Jeff DeWit is also reported to be planning to run. DeWit served as COO for Trump’s presidential campaign. Should he run, DeWit would be viewed more favorably by GOP primary voters than Flake or Ward, according to a survey conducted by conservative-leaning polling company Remington Research Group from Nov. 15-16. The poll of just over 1,100 likely GOP primary voters also showed that DeWit had a higher chance of defeating Flake in the primary than Ward. Whoever wins the primary, Waid said, the Democrats would still have a good chance, pointing to what he called a “strong (Democratic) bench.” Potential Democratic challengers could include Rep. Kyrsten Sinema, D-Phoenix, and Ann Kirkpatrick, a former congresswoman who lost in her bid to unseat McCain in 2016 – though neither has confirmed or could return requests for comment.